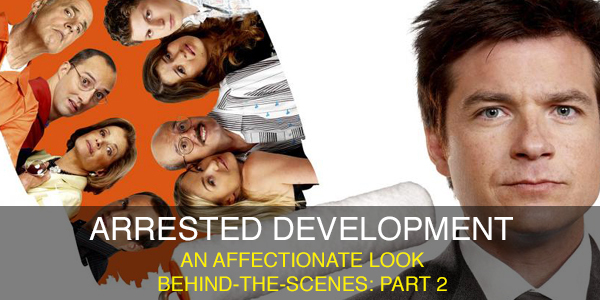 If you haven’t read “Part 1: Meeting Damon Wayans” you can find it here. Before Damon and I start writing MAJOR PAYNE, we decide we need to do some research at the Camp Pendleton marine base just outside San Diego. The marines are very accommodating (they’re Damon fans) and they invite us to come down and watch some basic training with a squad of new recruits. 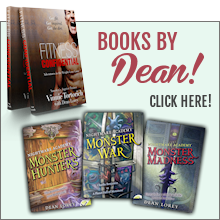 We drive through a gate guarded by marines with automatic weapons and we both realize, “this is serious.” We’re shocked when we meet the recruits, because they seem so young. They’re bald and covered in pimples. We’re introduced to a couple DI’s (Drill Instructors) and quickly learn that they’re assigned “roles” to play in the eyes of the recruits. One of them plays the hard-hearted badass who demands everything and gives nothing. Another one plays the slightly softer mentor, the guy who might actually listen to your problems. Turns out, the DI’s often switch roles when one squad graduates and new recruits come in. We’re surprised at how much of basic training is actually a carefully orchestrated show, a scripted little drama designed to make the DI’s seem almost superhuman. One of them tells us how, as he leads the squad on a run, he drifts to the back, then quietly slips away and relaxes for a couple hours, only to sneak back in at the end of their run, miles later. By then, the recruits are dirty and exhausted, but he appears to not even have broken a sweat, his uniform as clean as it was when he began! Those kinds of tricks help make the DI’s appear to be Godlike in the eyes of the recruits and Damon and I decide to do the same thing with Payne. He sleeps with his eyes open. He eats food at a supernatural rate. His hobbies include hanging upside down while cleaning his gun until “my nose start to bleed.” We’ve finally found a way into the character and we’re jazzed to start writing. Desperate, the men pry off the lid to reveal Major Benson Winifred Payne. He snaps open his eyes and says, “Does someone need killin’?” Then he single-handedly kills all the enemies and saves the men. It was ultimately deemed too silly, but so much of the movie is silly that it’s hard to find the line. Damon suggests that Payne shave the recruits bald. I’m concerned about this, because the kids range in age from fourteen down to around five years old. I think a bunch of little bald kids are going to look like they’re stricken with a terminal disease. He’s right. It turns out to be really funny (Major Payne: “From now on, my little group of shaved scrotum sacks, you will walk like me, talk like me, eat like me and, until you win those games, you will be BALD like me!”) Turns out, comedy isn’t for cowards. Sometimes you just have to trust your gut and roll the dice. After we write the scene where Payne tells little five-year-old Tiger his somewhat unusual version of “The Little Engine That Could,” Damon and I just look at each other and shrug. People may hate this movie… but we love it. Soon, it’s time to put the script aside, hire a director, cast the actors and start shooting… but before we can do that, we have to get past one huge problem. Check back soon for “Part 3: Shooting Major Payne” to get the scoop on how Joey Lawrence’s hair changed everything and how the villain from HALLOWEEN directed the movie. 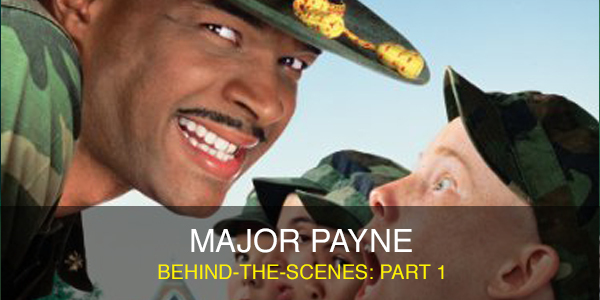 Major Payne is one of my favorite movies, being able to read how it started and the work that went into it is really awesome. Thank you for the insight into a movie that I’ve enjoyed for years. i love reading about payne because it was the first real movie i worked on! it will forever be my introduction to post production sound!!!! How bout that part 3? 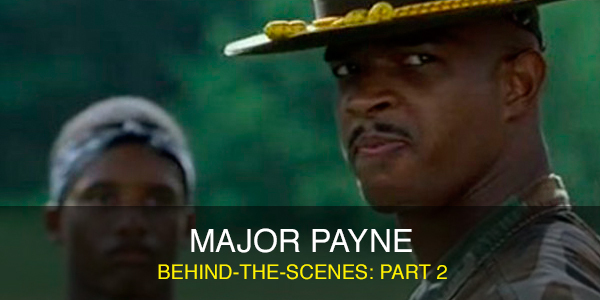 Please post more about Major Payne. Perhaps part 3? Photos?